Chairman Davis, Vice Chairman Bromwell, members of the committee, thank you for allowing me to speak with you today. My name is David Cooper. I am a senior analyst at the Economic Policy Institute (EPI) in Washington, D.C. EPI is a nonpartisan, nonprofit research organization whose mission is to research, develop, and advocate for public policies that help ensure the economy provides opportunity and fair rewards for all Americans, with a focus on policies to support low- and middle-income households. I am here to support the enactment of HB 1040, which would close a loophole in Maryland’s wage and hour laws that exempts many lower-paid managers and administrative workers from overtime pay when they work more than 40 hours per week. Importantly, this loophole would also exempt many of these same workers from the minimum wage if the state raises its minimum wage to $15, as I know this body has already passed legislation to do. I will explain in detail. Maryland law tracks federal law, specifically the Fair Labor Standards Act, the federal law that establishes the federal minimum wage and requires that employers pay a penalty (time-and-a-half overtime pay) when they require their employees to work more than 40 hours in a week. Before the FLSA became law in 1938, factory workers and office clerks often worked 60 or more hours a week, sometimes at miserably low pay. From the beginning, the FLSA’s overtime protections covered both production workers and many white-collar workers, from shipping clerks and typists to bookkeepers and accountants. Congress recognized that white-collar workers need time away from work just as much as blue-collar workers do. This enormous erosion of the salary threshold presents a serious problem for many Maryland workers. Under current law, a line manager at a fast food restaurant or a discount retailer being paid a salary of just $455 per week—that’s $23,660 annually—could be required to work 50, 60, 70 or more hours a week for no more pay than if they worked 40 hours. This exemption means that they are not legally entitled to any additional pay for the extra hours in excess of 40 per week, let alone time-and-a-half. The potential for abuse made possible by the ridiculously low threshold will become even more acute with a higher state minimum wage. A pay rate of $455 per week for 40 hours of work is equivalent to $11.38 per hour. If the state minimum wage is raised above $11.38 per hour—as I know this body has voted to do—those same lowly paid and only nominally “managerial” employees would also be effectively exempt from the new minimum wage. An employer could assign token managerial responsibilities to a full-time staff person and the employer would then only need pay the worker $455 per week—again, the equivalent of only $11.38 per hour for a 40-hour workweek. If that employee had to work more than 40 hours, the effective hourly rate paid would be even lower. There is no reason why someone with a job title that includes the word “manager”—but whose job primarily involves performing the same tasks as front-line staff—should be exempt from the same overtime and minimum wage protections afforded those front-line workers unless he or she is being fairly compensated. HB 1040 would raise the statutory salary threshold exempting professional, administrative, and professional employees to $900 a week, the equivalent of $46,800 annually. This is an incredibly important, yet arguably very modest, reform. In 2016, the U.S. Department of Labor finished a rulemaking to raise the FLSA’s salary threshold for exemption to $913 per week or $47,476 on an annualized basis.4 After DOL finalized its rule to raise the exemption threshold, a court in Texas blocked the department from implementing it.5 The Trump administration has since indicated that it intends to issue a new rule with a much lower threshold.6 Had the 2016 rule been implemented, this problem of severely eroded overtime protections for lower-paid managers and administrative workers would already be solved. But as is often the case, state lawmakers must now step in to fix a problem caused by decades of federal inaction. Without a clear and appropriate threshold, many low-level employees—such as assistant managers in retail stores or fast food restaurants—can legally be denied the minimum wage and overtime pay by their employers. The DOL rulemaking record is full of stories of employees working 60 or 70 hours a week without any extra compensation for their long hours. HB 1040 would say that no one paid less than $46,800 a year should work more than 40 hours a week without getting paid time and a half for the extra hours, and they must receive at least the minimum wage for all hours worked. Setting an appropriate threshold also brings needed clarity to the rights of employees who are already covered and to the duties of their employers. Many salaried employees paid above the current $455 per week threshold are entitled to overtime pay because their primary duties are not executive, administrative, or professional. Employees who are entitled to overtime protection because they don’t meet the duties test for exemption include workers in scores of occupations, from paralegals and postdoctoral researchers to dental assistants and copy editors. Most bookkeepers are entitled to overtime pay, for example, but many do not know it, and neither do their bosses. With a $46,800 salary threshold, at least the employees paid less could be sure of their rights. Altogether, there are about 219,000 salaried employees in Maryland who would have their right to minimum wage and overtime protections established or clarified by a higher threshold. 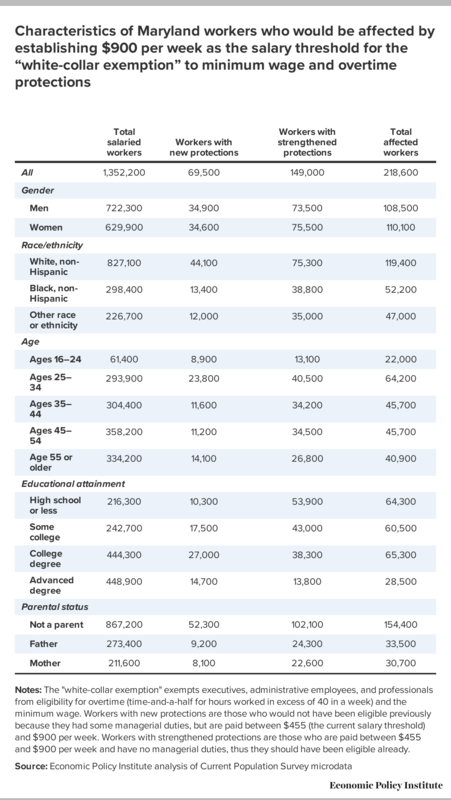 The demographic characteristics of these affected workers, and those who would be newly protected, are listed Table 1. Notes: The "white-collar exemption" exempts executives, administrative employees, and professionals from eligibility for overtime (time-and-a-half for hours worked in excess of 40 in a week) and the minimum wage. Workers with new protections are those who would not have been eligible previously because they had some managerial duties, but are paid between $455 (the current salary threshold) and $900 per week. Workers with strengthened protections are those who are paid between $455 and $900 per week and have no managerial duties, thus they should have been eligible already. They can reduce the hours of overworked employees and share the employees’ workloads with other employees. For example, an assistant manager who now helps stock shelves and clean floors, adding 20 extra hours to her work week without any extra compensation, can have that work assigned to part-time employees, who will benefit from the extra hours and pay. They can pay overtime for the extra hours put in by employees whose salaries are too low to raise above the threshold. For many years, other states have set their own salary thresholds rather than rely on the U.S. DOL. And several states have recently announced they are updating their salary thresholds as well. California sets its threshold at twice the state minimum wage, which is set to go to $15 an hour in 2022. The threshold is currently $960 a week ($49,920 annually), and will rise in steps to $62,400 annually by 2022 (2023 for small employers).8 New York sets its threshold at 1.875 times the minimum wage. The threshold is currently $1,125 a week ($58,500 annually) in New York City, $832 a week ($43,264 annually) upstate, and $900 a week ($46,800 annually) in the NYC suburbs. The thresholds will rise to $58,500 in the suburbs and $48,750 upstate by the end of 2020.9 Pennsylvania announced last year that it too will raise its overtime threshold to $47,476 annually (or, $913 a week)—matching the 2016 DOL rule.10 The executive branches in Washington State, New Jersey, and Colorado also have all indicated that they intend to raise their state salary thresholds. HB 1040 is an essential correction to a serious loophole in state law and a critical element of this legislature’s desire to raise pay for low- and middle-wage workers in Maryland. HB 1040 would help restore one of the core labor standards—the right to overtime for excessive work hours—that protected workers in the United States prior to the wage stagnation and growing inequality that plague our economy today. I strongly urge you to enact HB 1040, not only to restore basic overtime protections that should have been maintained at the federal level, but also to preserve the integrity of the minimum wage increase that this legislature has recently passed. 1. U.S. Department of Labor, Wage and Hour Division, “Fact Sheet #17A: Exemption for Executive, Administrative, Professional, Computer & Outside Sales Employees Under the Fair Labor Standards Acts (FLSA),” revised July 2008. 2. Celine McNicholas, Samantha Sanders, and Heidi Shierholz, What’s At Stake in the States If the 2016 Federal Raise to the Overtime Pay Threshold Is Not Preserved—and What States Can Do About It, Economic Policy Institute, November 2017. 3. Economic Policy Institute analysis using Current Population Survey microdata. 4. U.S. Department of Labor, Wage and Hour Division, “Final Rule: Overtime,” revised January 2018. 5. Ross Eisenbrey, “Ruling Against Overtime Is Wrong in So Many Ways,” Working Economics (Economic Policy Institute blog), November 30, 2017. 6. Heidi Shierholz, “The Trump Administration Wants to Prevent Millions of Workers from Getting Paid Overtime” (statement), Economic Policy Institute, February 28, 2019. 7. Economic Policy Institute analysis using Current Population Survey microdata. 8. State of California Labor Code, Section 515. 10. Office of Governor Tom Wolf, “Governor Wolf to Modernize Outdated Overtime Rules to Strengthen the Middle Class and Provide Fairness for Workers” (press release), January 17, 2018.